Classical music is one of the most underrated genres of music in the musical universe. It is a genre that for ages has received a completely undeserved reputation. The same can be said of those that call classical a favorite genre. Thankfully there are those out there that have and do even today make an effort to reverse that reputation with releases whose aims are to nip the proverbial problem in the bud. They are aimed at young listeners, hoping to prove the value and importance of classical music even in today’s society. This Friday, Doctor Noize and the International Band of Misunderstood Geniuses will join those ranks with the release of their new album Phineas McBoof Crashes The Symphony. The double-disc recording is the band’s latest adventure from their ongoing series of adventures from the musical monkey megastar. It is a recording that should be in every elementary and middle school music class and in every family’s home. That is proven in large part through the story at the center of the record. The performance on the part of Doctor Noize and company is just as important to note as the story. That will be discussed later. The music presented over the course of the two-act musical is the finishing touch to this record. It rounds out the record’s most important elements and completes the record’s presentation. Together with the record’s story and the cast’s acting all three elements join together to make Phineas McBoof Crashes The Symphony one of 2016’s top new children’s albums so far if not the year’s best so far. 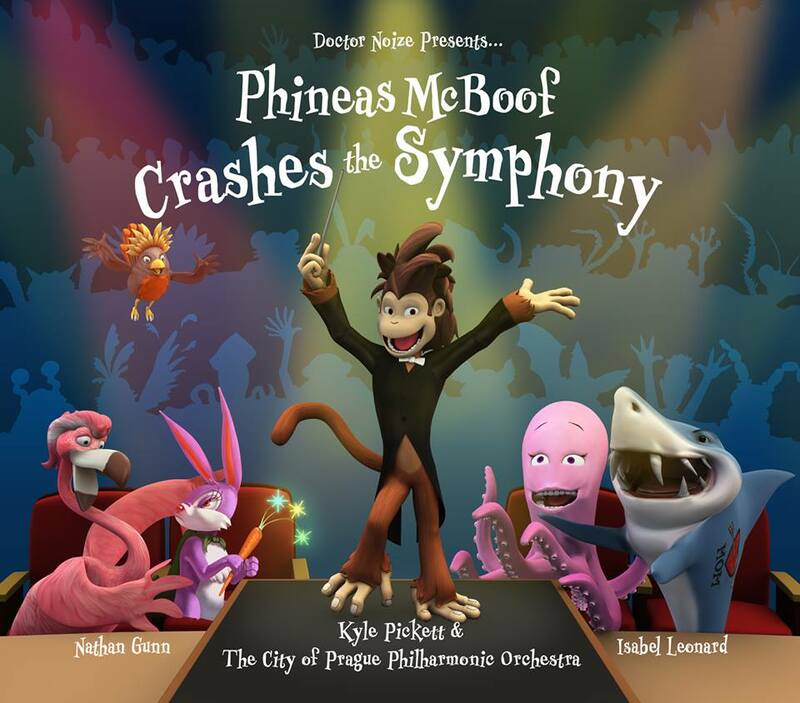 Phineas McBoof Crashes The Symphony is one of 2016’s top new children’s albums so far if not its best so far. That is proven in large part to the story at the center of the double-disc record. The story picks up somewhat where The Return of Phineas McBoof left off. McBoof is a world-renowned musical monkey. And he has even more friends on board in this album in the form of Luciano Frogerati, Jose The Ferret, and Placido Flamingo among a whole cast of others. The story launches with the disappearance of Phineas. Nobody seems to know where he is at first. That is until a not so little bird gave Phineas’ band mates a clue about his whereabouts. They followed the clues until they found him. The story doesn’t end there. There is also a maniacal bunny bent on stopping Phineas and his band mates for her own diabolical purposes. And she chases them throughout the story right to its climactic finale. Along the way there are some fun lessons about the different instruments that make up an orchestra and even different styles of classical music just to name a couple of extra elements. The whole thing is set to a presentation that one can actually almost envision in a live setting and not just on record. That is just this critic’s own interpretation of course. It would be interesting to see this story actually played out in a live setting. It could potentially be a success for Doctor Noize and his fellow musicians. That is thanks not just to the story but to the work of the band and other actors alongside the musicians of the City of Prague Philharmonic Orchestra. Their work is also another reason that the record is such a success even in an audio-only presentation. The story at the center of Phineas McBoof Crashes the Symphony is a key element in the success of this latest adventure story from Doctor Noize and the International Band of Misunderstood Geniuses. It is just one of the story’s key elements. The work of the band (fronted by Cory Cullinan—a.k.a. Doctor Noize) and that of the members of The City of Prague Philharmonic Orchestra is another element in the success of this record. Cullinan and company come across as being so genuine in their portrayal of McBoof and his band. Isabel Leonard is one of the most notable members of the play’s cast. She gives voice to the angry bunny “Mama.” Her madness over the popularity of Phineas and his band mates is so over the top that it will leave listeners in stitches early on. As the story reaches its end, Leonard’s portrayal of Mama will move listeners on a much more emotional level. And John McVeigh is just as entertaining as Mama’s vegetarian shark Mama’s Boy (yes, a vegetarian shark). He makes for a great comic relief from start to finish. That is especially when he reveals his true talent in the play’s final scenes. The rest of the cast is just as entertaining in its own right. It work couples with that of Cullinan, McVeigh, and Leonard to make for an overall performance that will keep listeners completely entertained and engaged from beginning to end. Of course theirs isn’t the only notable performance here. The members of the accompanying orchestra are just as impressive in their coordination with the band members. Every accent, every crescendo and decrescendo is perfection from one scene to the next. The end result of their work, when coupled with that of the band/cast is a performance that will ensure even more listeners’ maintained entertainment and engagement. It makes even more solid the ability to see this adventure being played out in a live stage setting. This makes the record’s presentation that much more solid and enjoyable. It still is not the last element to take into consideration in considering what makes the record so successful. The music that is incorporated into the story is just as important to the record’s presentation as the record’s story and the work of the performers. The story at the center of Phineas McBoof Crashes The Symphony and the work of the performers in bringing the story to life are both key elements in the record’s presentation. The story itself will keep listeners entertained and engaged with its originality and creative approach. The performers (including the orchestral members) are to be just as commended in the work that they put in to bring the story to life. In the case of the band members/cast they are entirely believable in their portrayals of Phineas and his band mates. In the case of the orchestra members, their work is to be applauded, too. That is because of the professional performance put on by the group in whole. The orchestra is spot on from beginning to end, making the story that much more enthralling and encompassing. As important as both elements are to the record’s presentation they are not its only important elements. The music that is incorporated into the record is just as important to its presentation as its story and the work of the performers. The music in question includes elements of some great classical pieces as well as some music theory lessons incorporated into each one. One of those pieces even connects the modern practice of using the “Verse/Chorus/Verse/Bridge/Chorus format to the ABA format in classical music. The connection is used to exhibit just how far back the practice used by today’s most popular artists goes. This revelation is certain to surprise young listeners (and possibly older listeners, too) just as much as the younger listeners taking in the lesson on the record. So not only do listeners get a brief introduction into classical music history thanks to the record’s featured compositions but they will also get a brief but concise introductory music theory lesson. The lessons in whole make this introduction to classical music that much more enjoyable and important not just for children but even for older audiences that might have otherwise never even given classical music a chance. Together with the record’s story and the work of the performers, it could even be argued that the record in whole is a great introduction to both classical music and even musical theater for audiences of all ages. Keeping this in mind, the record becomes even more important in this year’s field of new family and children’s records. In fact all things considered, the record becomes, in whole, one of the year’s top new records in that division so far if not its best so far. To keep up with the latest sports and entertainment reviews and news go online to http://www.facebook.com/philspicks and “Like” it. Fans can always keep up with the latest sports and entertainment reviews and news in the Phil’s Picks blog at https://philspicks.wordpress.com. This entry was posted in Celebrities, Internet, Music and tagged celebrities, Cory Culligan, Doctor Noize, entertainment, facebook, internet, Isabel Leonard, John McVeigh, music, Phils Picks, Phineas McBoof, The City of Prague Philharmonic Orchestra, Twitter, Wordpress by philspicks. Bookmark the permalink.